Any Beach Baby will love this bib! 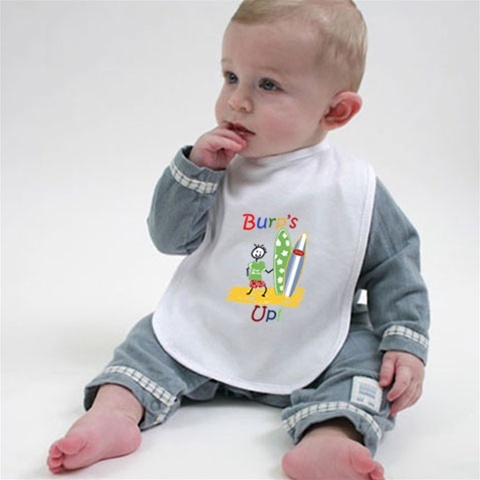 Burp's Up Baby Bib! - Every baby is ready to hit the beach with our original "Burp's Up!" baby bib. 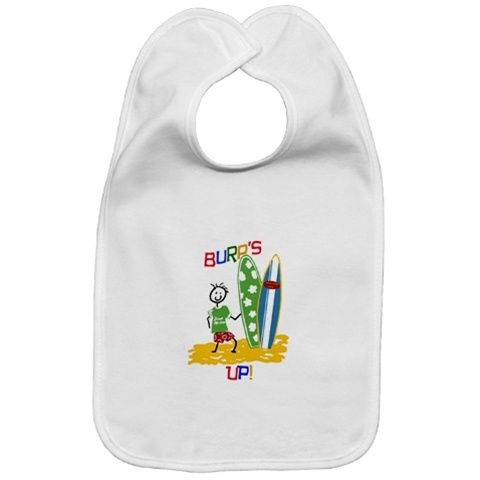 Our beach baby Burp's Up bib features a hand drawn surfer stick figure on the beach and ready to hit the waves. 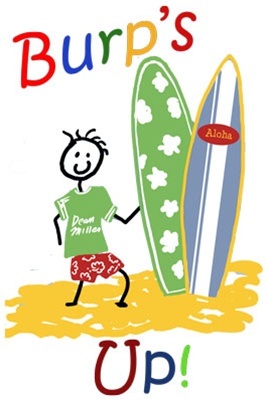 A Dean Miller exclusive beach baby design. It's okay to make a mess or burp up in our easy-wash 100% cotton baby baby bib. These beach baby bibs provide great upper body coverage to protect your baby's surf clothes. The sturdy closure on our bibs makes this one-size fits all beach baby bib fit even the smallest surfer newborn, all the way up to 36 months. Our beach baby bis are made with 100% jersey cotton and measures 9" x 15" top to bottom and 9" x 10" bottom to collar. Goes great with our Hawaiian baby bedding. Click on image for larger view of our beach baby Burp's Up! bib or scroll your mouse over the design, and remember you can always call us at (949) 370 - 6535 with any questions you have! Beach Baby Bibs are $24.99 each and in stock ready to ship.